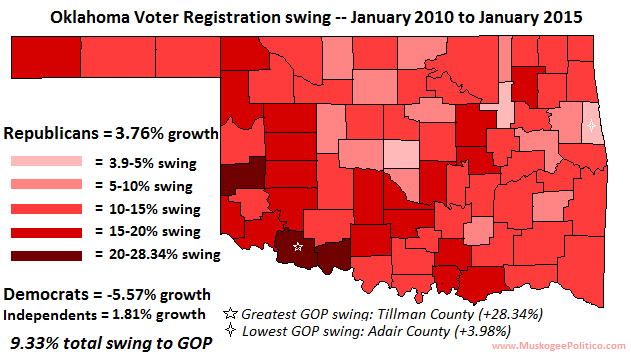 Here's an update to my Voter Registration Maps series, detailing five years of registration changes in Oklahoma. Since 2010, Oklahoma Democrats have lost 117,169 voters (-5.57%) and the majority, Oklahoma Republicans have gained 72,995 voters (3.76%) and the plurality, and independents have grown by 35,831 voters (1.81%). The lowest swing for the OKGOP came in Adair County (3.98%), and the highest was in Tillman County (28.34%). Oklahoma and Tulsa counties had the second and third slowest swing to the GOP (4.19% and 4.67%). Democrats had positive movement in zero counties.